One of the must-do´s when you travel, especially on a Barcelona holiday, is to check out the local shopping scene. That being said, there are many tourist-oriented shops that tend to be rather overpriced, gaudy, and incredibly generic. We know that on your Barcelona vacation, you want to have the most authentic shopping experience possible, so we´ve put together a great list of some of the best shops in Barcelona, organized by neighborhood. Be sure to check them out soon though, because due to the rising cost of rent, 2015 may be the last year that these gems stay open for business! There are plenty of neighborhoods in the city of Barcelona that are worth exploring. In the old city (Ciutat Vella), La Boqueria–one of the most amazing food markets in the world–is located just off the busy thoroughfare of La Rambla. At the open-air market, food lovers can unite and enjoy some of the freshest Spanish foods available. Just across La Rambla is the old and beautiful neighborhood of Barri Gótic where there are plenty of interesting and one-of-a-kind boutiques in Barri Gótic. Cereria Subirá is a 250-year-old candle shop that has truly stood the test of time. If you´re a music lover, El Raval is your dream neighborhood come true. The area on the south side of La Rambla is full of local music shops, but the biggest one is Discos Castelló, which is filled to the brim with some of the world´s best vinyl. If you feel like pampering yourself, Les Topettes has the finest bath and body products. La Ribera used to be a textile district, but now it is home to artisan boutiques that make their products on an upstairs mezzanine, ensuring the utmost authenticity. If you happen to be near the beach, you´ll be sure to find some treasures in the crafts market in Port Vell in Barceloneta! 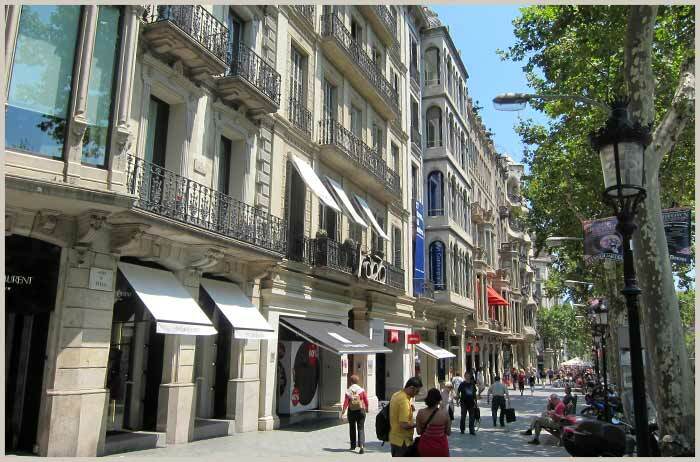 If you want the ultimate luxury experience, L´Eixample has the higher-end retail, such as Armani, Chanel, and Gucci. Even futher into the neighborhood of Grácia, you can find incredibly unique clothing stores such as Érase Una Vez, and Mushi Mushi among many other local boutiques. There are countless stores that are worth visiting during your Barcelona holiday, but unfortunately, they won´t be around forever. Take this chance and check them out while you still can!